The 51st Jalsa Salana (Annual Convention) of the Ahmadiyya Muslim Community in the United Kingdom concluded on Sunday 30 July 2017 with a powerful and faith-inspiring address by the World Head of the Ahmadiyya Muslim Community, the Fifth Khalifa (Caliph), His Holiness, Hazrat Mirza Masroor Ahmad. 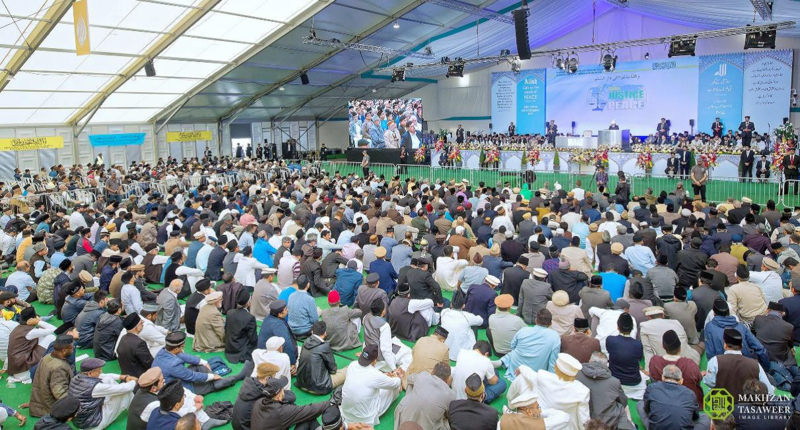 More than 37,000 people attended the Jalsa Salana, which took place at Hadeeqatul Mahdi in Alton, Hampshire. Apart from the thousands of Ahmadi Muslims who participated, many non-Ahmadi and non-Muslim guests also attended. The entire event was also broadcast live on MTA International and streamed online. 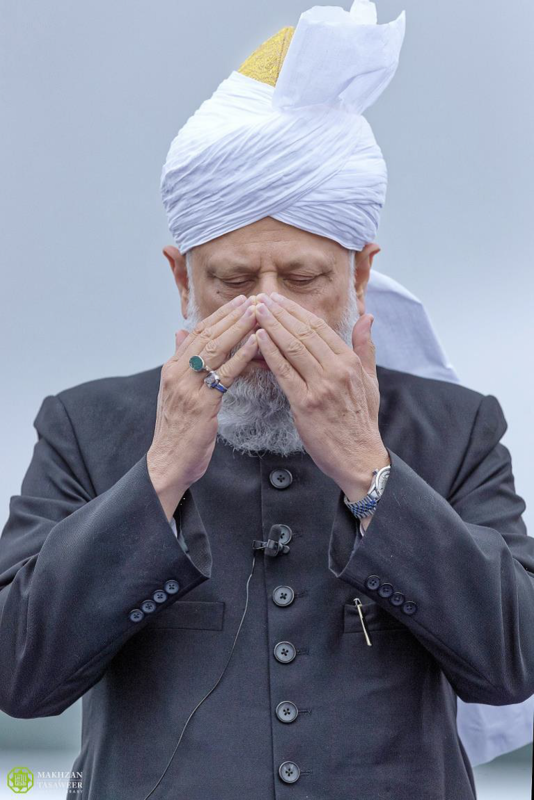 A highlight of the three-day Jalsa Salana was the pledge of allegiance, known as Bai’at, that took place on Sunday afternoon, where the participants pledged allegiance to Hazrat Mirza Masroor Ahmad as the Fifth Khalifa (Caliph) of the Promised Messiah (peace be upon him). The participants formed a human chain leading to the Khalifa as they repeated the words of the pledge in unison. 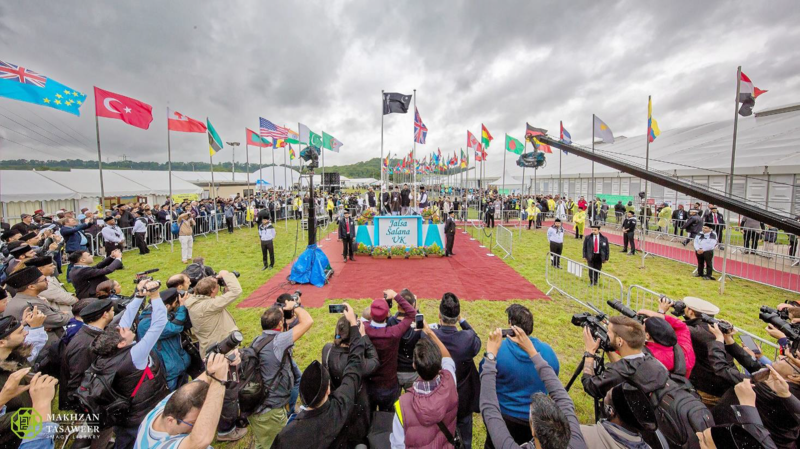 Prior to the ceremony, His Holiness announced that more than 600,000 people had joined the Ahmadiyya Muslim Community during the past year from all around the world. 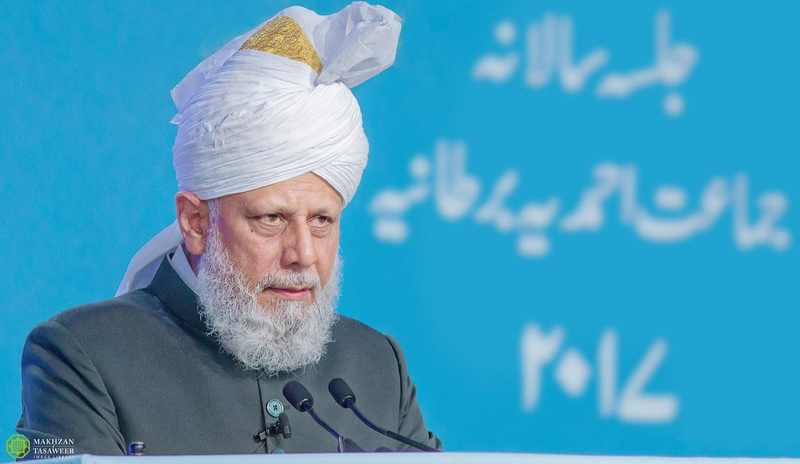 He further announced that the Ahmadiyya Muslim Community was now established in 210 countries. 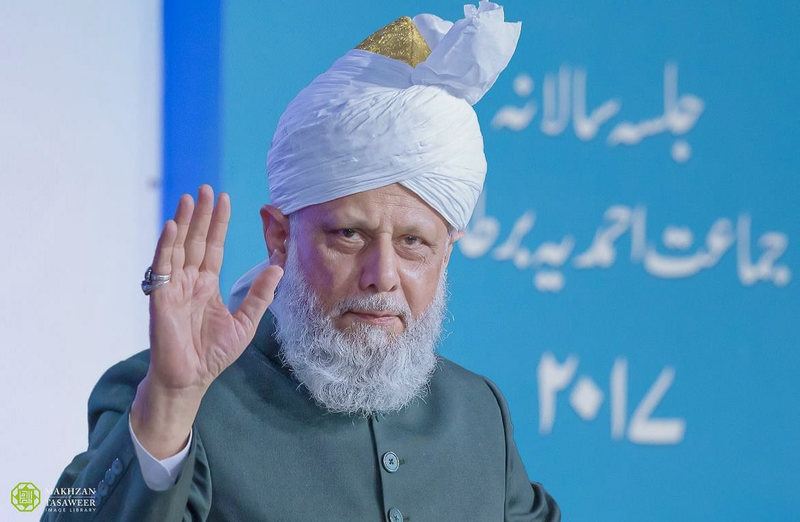 During his concluding address, His Holiness spoke of the consequences of the negative publicity Islam received in much of the world and how the Ahmadiyya Muslim Community sought to counter the false narrative being perpetuated. Refuting those who sought to justify their hateful terrorist acts in the name of Islam, His Holiness stated that the Quran categorically stated that there should be no compulsion in religion. He said that Allah the Almighty had forbidden the Holy Prophet Muhammad (peace be upon him) from using any force or compulsion in order to spread Islam and, given this, how could it be possible for any Muslim to be given a licence not afforded to the Prophet of Islam (peace be upon him) himself. During his address, His Holiness condemned the trading of arms and said that Western powers were fuelling wars in the Muslim world by selling weapons to certain Muslim countries or providing them to certain rebel groups. His Holiness said that Muslim countries did not have the capability to produce the sophisticated weapons that were ruining their countries and they were being imported from abroad. Such weapons were ending up in the hands of terrorists and extremists and causing destruction and devastation. His Holiness also gave a comprehensive response to those who questioned why the early Muslims engaged in warfare. His Holiness made it clear that all wars fought during the period of the Holy Prophet (peace be upon him) and his four rightly guided successors were defensive wars fought to defend the principle of universal religious freedom. Concluding his address, His Holiness said that Islam alone provided the solutions to the world’s problems. 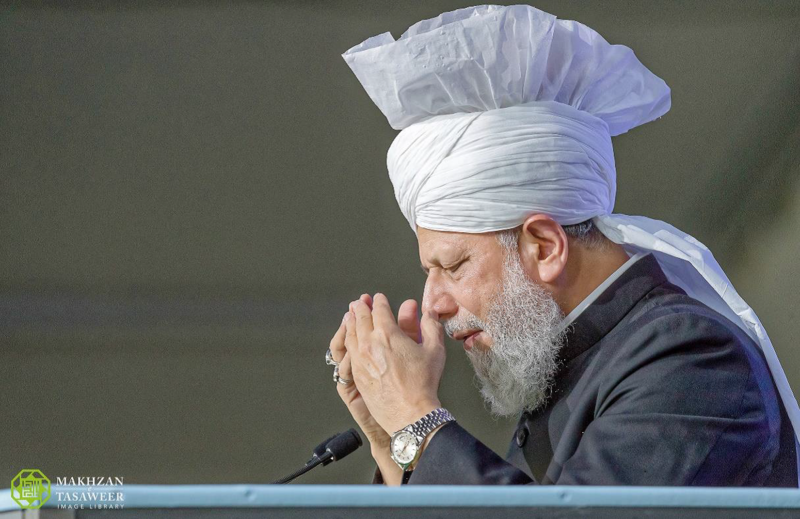 The Jalsa Salana concluded with a silent prayer led by His Holiness. 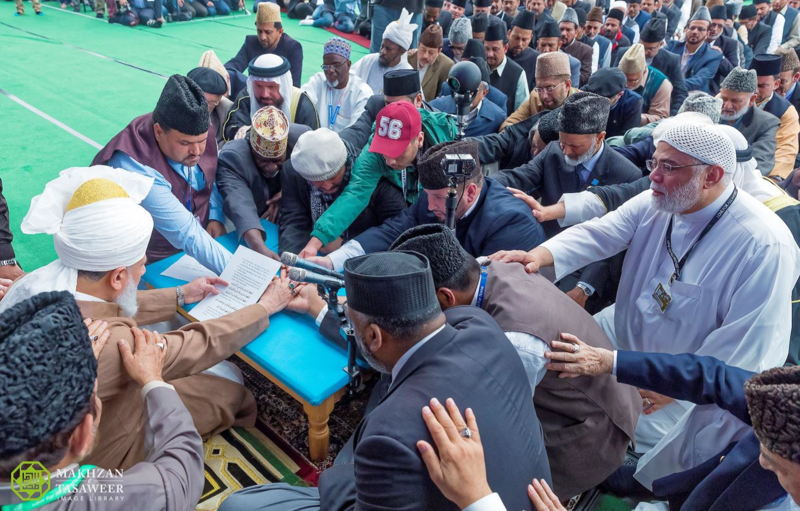 During the 3 day convention, His Holiness delivered five addresses and various other scholars gave addresses expounding upon Islam’s true teachings.